In NFU Mutual’s continuing series on small farms, we spoke to a publican who manages to make time to farm around his other commitments. 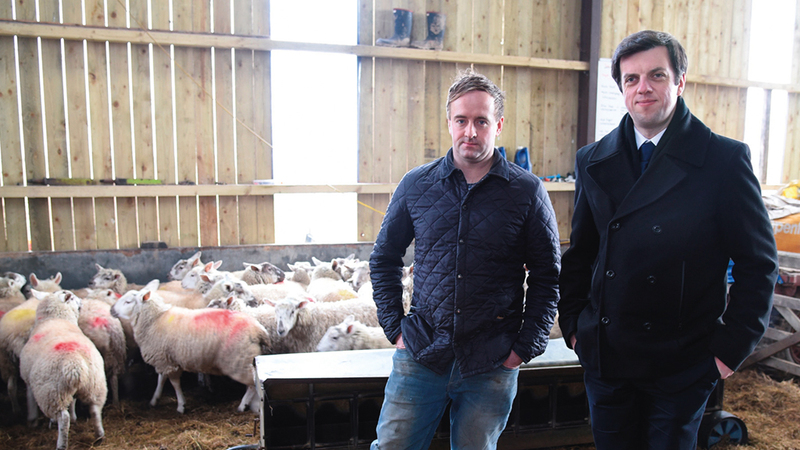 Matt Rogers (left) with his local NFU Mutual Agent Mike Hadfield. Driffield publican Matt Rogers has always wanted to farm. He spent his formative years watching his dad working on one and has done many jobs on units around North Yorkshire since he was a child. Lacking the funds to buy his own land, and with no family farm to take on, it was beginning to look like it would remain an unfulfilled dream. That was until, in 2011, he got chatting to a landlord while tending to his allotment. “I got an allotment because it had a shed to keep my vintage collection of garden machinery in, but I really enjoyed it and things developed from there,” Matt said. “A local landowner said he had the ideal place for me – about five acres which had been pretty much left unattended for years. He stocked his new piece of rented land with 100 hens and six orphaned ewe lambs and put up stock proof fencing. The free-range chickens formed the basis of an egg round while he concentrated on growing his sheep flock. Concerned his small plot of land would soon be taken for housing, Matt began to look for a bigger site and more grassland. He found it, less than half a mile away. He says: “It’s about 10 acres and the landlord just wanted someone to keep it tidy. There are two paddocks and we put up a Dutch barn with three 18ft bays. Now we’ve got a shed that’s big enough for machinery and for lambing. The flock is formed predominantly of Suffolks and Texels, with some Mules brought in for their maternal qualities. One Suffolk ram covers the flock, put to the ewes on Bonfire Night each year to target a lambing start date of April 5 – Matt’s birthday. He takes the unusual step of housing his lambs from December to ensure they have sufficient forage during the winter. Matt says his finished lambs are ‘probably a bit too fat’ at present – going to slaughter at Glaves and Sons Butchers at Brompton, weighing a little over 30kg. The animals are butchered, boxed and sold to friends and family rather than through a market as the returns are better. “We don’t rush the lambs and they are about a year old when they go to slaughter. The feedback from customers has been really good,” he says. Matt is convinced that watching farm machinery as a boy stirred his passion to farm. He now has three tractors of his own – a Massey Ferguson 65, a Massey Ferguson 690 with a loader and a Ford 6610. A post banger is also an important accessory to his farm as he plans to install sheep catching facilities across all his grazing land this year. Matt admits the sheep, hens, seasonal turkeys and occasional pig are little more than a hobby – a piece of escapism which allow him to fulfill his passion while keeping up with a hectic working schedule. Running the Original Keys in the centre of Driffield is just one of his commitments, alongside being a dad and a town councillor. He even found time to be the town’s mayor in 2016. Having left a career as a behavioural pastoral manager, working with children across the East Riding of Yorkshire, Matt came across the opportunity to become a landlord himself, but not in the farming sense. Having been a DJ in the pub at weekends for 12 years, he decided to take on the remaining 10-year lease from its retiring tenant. He manages to juggle his commitments with the help of friends and family. His partner, care home manager Leigh Moir, also works at the pub while friend Kevin Stack looks after the 80 free-range laying hens at the farm year-round. “People think I’m mad but when you juggle all these commitments you just don’t stop, you have to get on with it,” Matt adds. On a typical day he will be up to take a beer delivery, complete the pub’s paperwork, open up and sometimes man the kitchen for the lunchtime trade. Evenings are often filled with council meetings, looking after his daughter and, of course, farming. “I’m a great believer that you can spend too much time doing one thing,” he says. “Fitting in farming is hard because, for example, if you’re making hay in the summer you only have that one window of opportunity so I have to staff the pub and get on with it. “It’s a balancing act but it is a hobby – it doesn’t make me any money at the moment but it will do when we get the sheep numbers up.